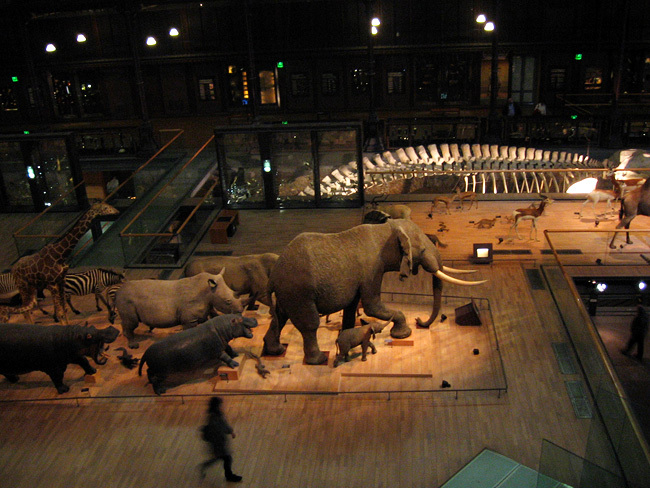 La Grande Galerie de l'Évolution. Live human being provided for scale. 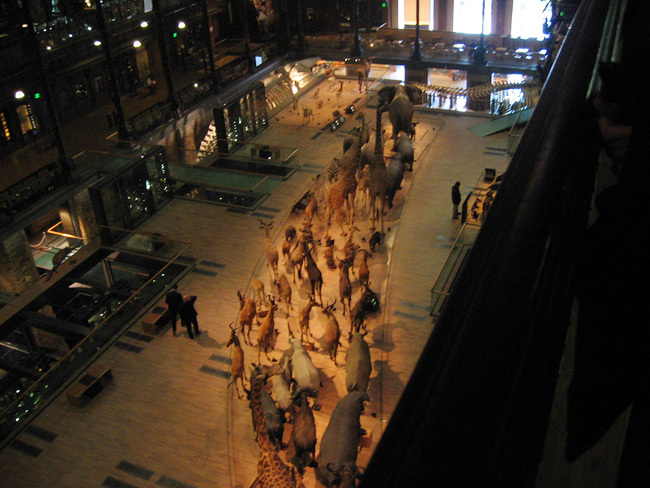 La Grande Galerie de l'Évolution  the Grand Evolution gallery  is a natural history museum that's part of the Muséum National d'Histoire Naturelle. 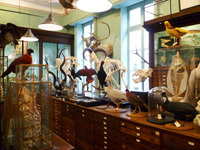 Housed in its own building, the Grande Galerie is loaded with tons of wonderful old-fashioned taxidermy, and focuses on evolutionary biology, diversification of species, extinct and endangered species, etc. For me, part of the Grande Galerie's allure is that it's an old museum, and both the exhibits and the museum space are a bit antiquated; this museum bears absolutely no resemblance to modern, computerized, commercialized museums, which in my opinion are a lot less magical and fun. 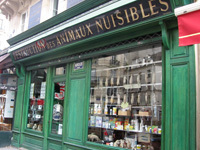 Before visiting the Galerie, I'd always heard that the place was a bit run-down and creepy, which for me is definitely a plus! It turns out it is all of those things and more, and I really enjoyed the vibe of the place. The building itself is beautiful  with intricate brass railings and old-fashioned glass and wooden cabinets  and the exhibits are reminiscent of earlier times; not much information is given about anything and you can tell the displays were designed a long time ago for people who'd probably never had the chance to see a dead elephant or a giraffe before (let alone a live one); heavy on the spectacle and light on the science. The building is extremely dark, and I couldn't tell if this was in keeping with the original old-timey feel of the museum, or more to hide the fact that most of the dead animals' fur was faded and falling out. I adored the somber ambience, but the dim lighting made photography pretty difficult, as you can see in my example above. La Grande Galerie de l'Évolution. They're headed for the exit! 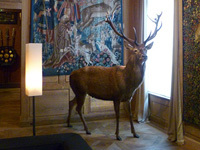 The centerpiece for the museum is a sort of Noah's-Ark-like procession of taxidermied animals winding their way through the middle of the building, while the outer edge of the museum's four floors are lined with other smaller exhibits, many of which are quirky and fascinating. Perhaps the most dramatic is the stuffed elephant wearing a typical Indian howdah on top... with a snarling stuffed tiger clawing its way to the top. There's also a small and really neat exhibit on taxidermy itself, involving several dead leopards displayed in a row in various stages of the process. So much neat, old stuff packed into one fantastic building. 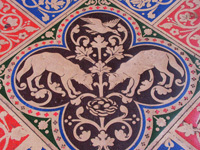 Bloodthirty wolf pack that terrorized Paris in 1450.